Hey, people! I apologize in advance- this post was supposed to be up sooner, but I just came down with a cold that knocked me out for a few days. Think sore throat, runny nose…I’ll spare you the rest of the gory details. Mostly I was just really unhappy that I had to miss ballet class. But after copious amounts of warm liquids, I think I’m finally starting to feel better. And, in light of said recent event, what better way to come back than with a nice hot soup, perfect for when you’re feeling under the weather, or you just want a delicious and simple dinner that requires minimal time and preparation. Now, I feel a little weird about calling it ramen, since that’s a notably unhealthy food and, *gasp*, I’ve never actually tasted it for that very reason, but that’s what it reminds me of, at least in terms of looks. That said, this version is way healthier and (probably) way more delicious, without any MSG or weird preservatives. It’s loaded with powerful nutrients and delicious flavor from vegetables (shoutout to sweet potato! 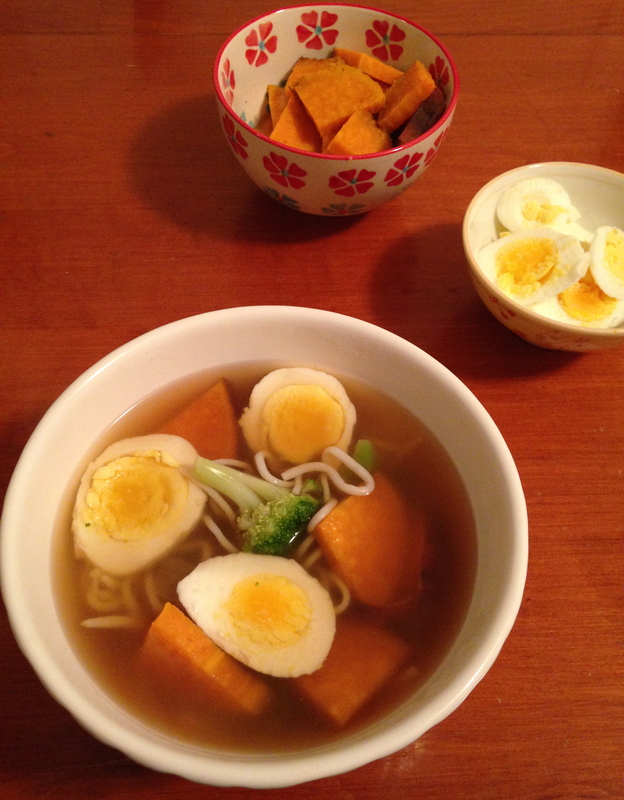 #heartywintervegetablelove), protein from the eggs, and yummy gingery miso flavor from the broth. I’m not going to say this soup healed me, because that would be a lie…but it definitely made me feel better, as good food often does. Slurp! Start by preheating your oven to 400 degrees fahrenheit. Prepare your sweet potato for roasting by washing it and gently scrubbing away any dirt on its surface. 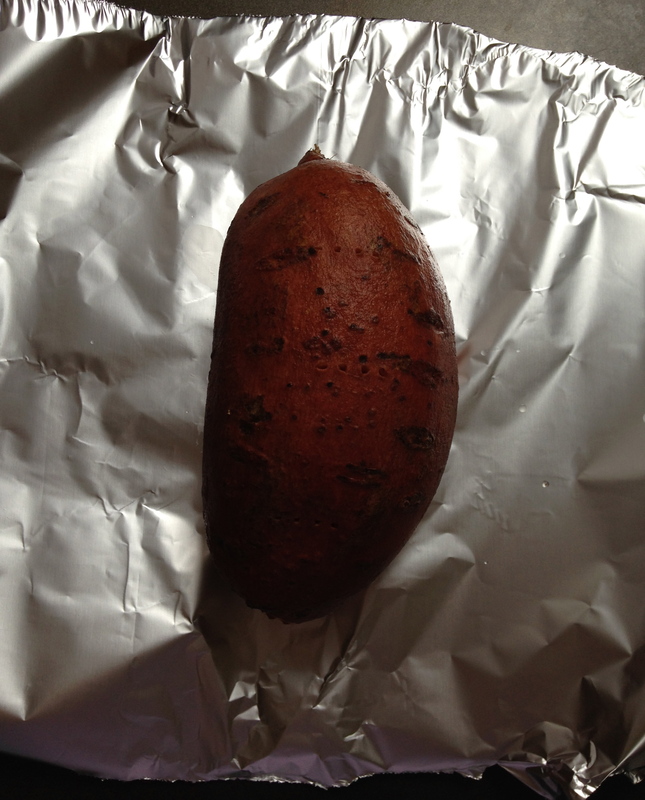 Pat dry, and use a fork to make a few small holes in the top of the sweet potato. 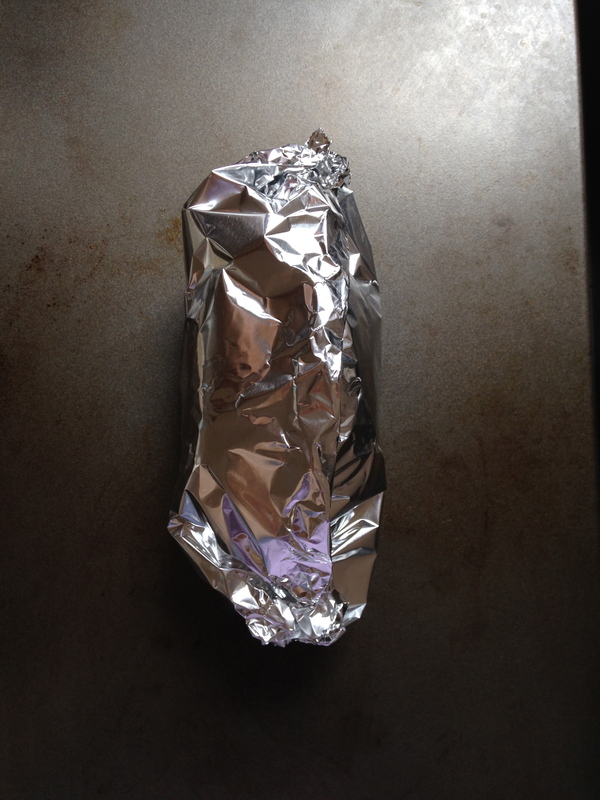 Then give it a hug because you love it so much wrap it loosely in tin foil and place on a baking sheet. Set aside. Fill a medium saucepan with water and place over high heat. Using a skewer or the tine of a fork, carefully make a small hole in the base of each egg without cracking the shell. 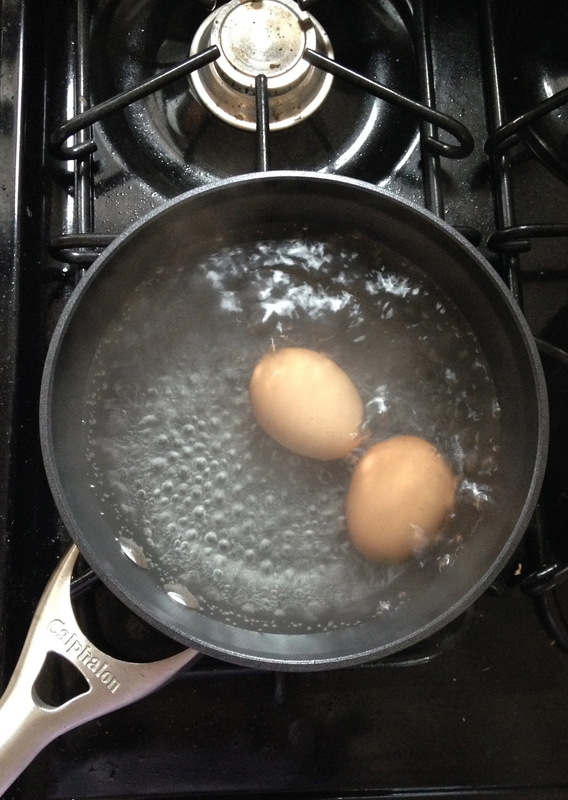 When the water reaches a rolling boil, reduce the heat to medium low and cook the eggs for ten minutes. After placing the eggs in the water, prepare an ice bath for the eggs in a medium sized bowl, and allow the eggs to sit for five minutes after cooking. This will allow the shells to loosen, making them easier to peel. Peel the eggs and set them aside for later use. 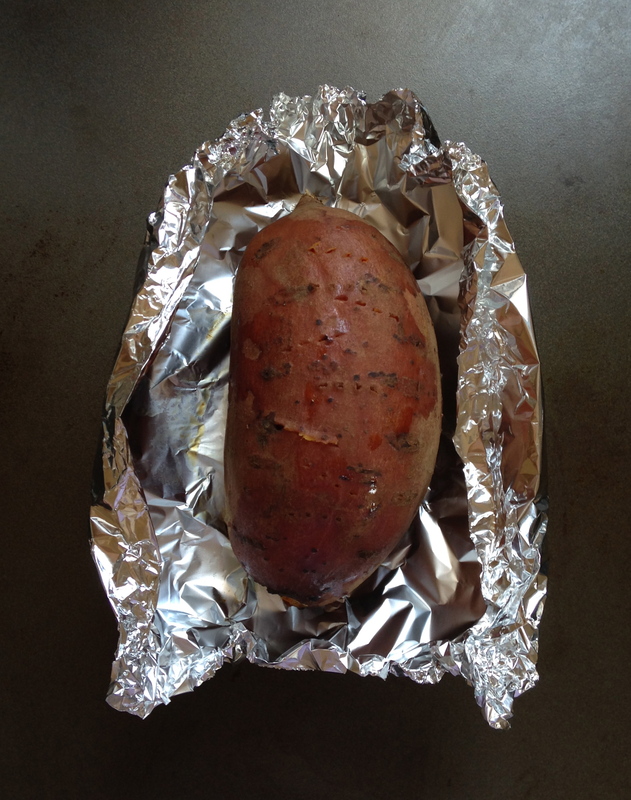 Once your oven has reached temperature, place your sweet potato in the oven and bake for at least 30 minutes. Depending on the size and density of your sweet potato, it will probably take between 45 and 60 minutes to cook fully. I usually check mine after 45 minutes and every 15 minutes after that. When it is done, the flesh should be easily forkable and the skin significantly softened and slightly loose. Remove from the oven and set aside to cool. 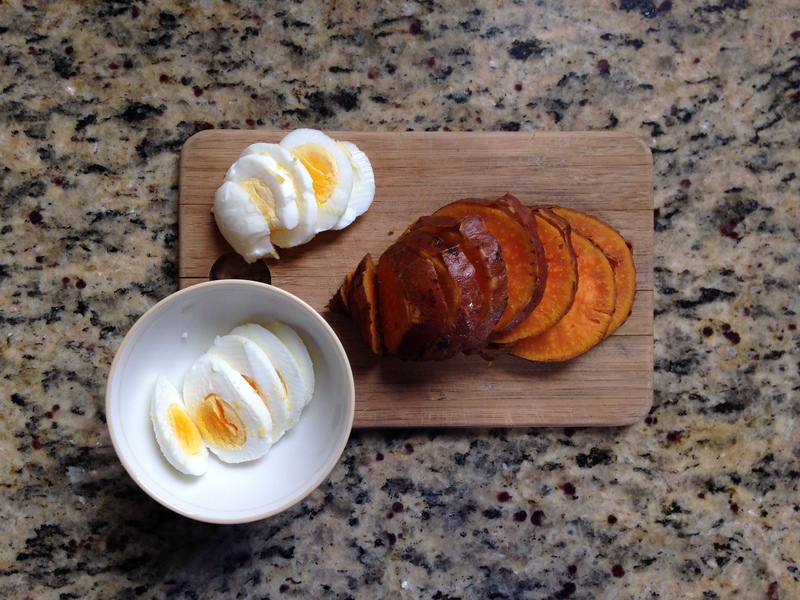 Once it has cooled enough to touch, slice the sweet potato into rounds and cut the rounds into quarters. If you have a smaller sweet potato, you may only need to slice them into halves. Whatever the size, the goal is small, bite sized pieces. Next, slice your eggs lengthwise. Set aside in bowls for later use. Ta da! Your prep is now complete. I usually do these steps when I have some time in the afternoon before I want to make this recipe, but you can definitely prep these elements a few days or a week before you plan to cook the soup because they’ll keep in the fridge. Just make sure to keep your sliced sweet potato in a bowl with a lid or covered in cling wrap so it doesn’t go soggy. Now for the soup itself. 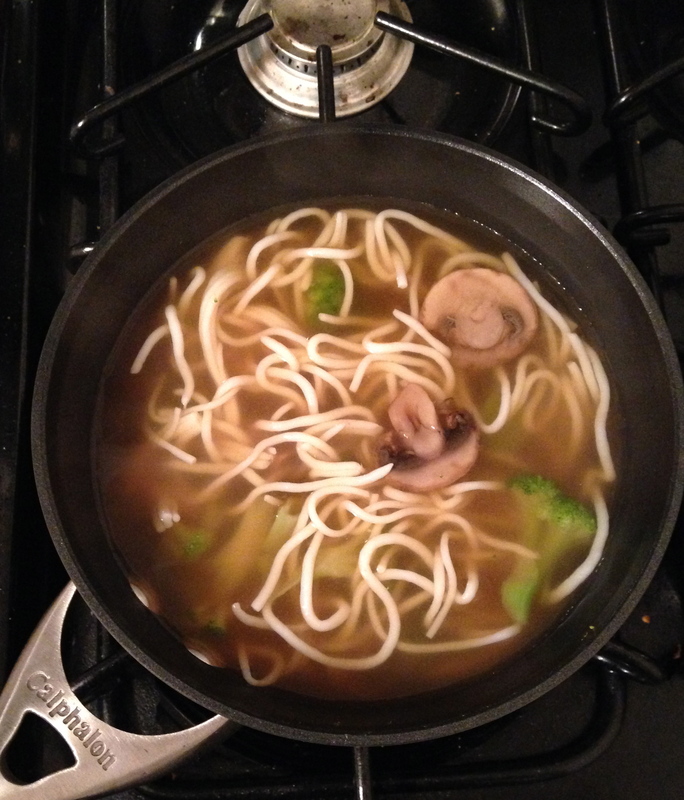 Pour the miso ginger broth into a saucepan and place on the stove on low heat. Add in the sliced mushrooms, cover, and leave for about 5 minutes, until the mushrooms have begun to soften, stirring occasionally. While the soup cooks, place both packages of shirataki noodles in a colander and rinse well under lukewarm water, using your fingers to separate the noodles from each other. Leave to drain. Return to the saucepan and add in the frozen leeks and frozen broccoli. I used frozen vegetables purely for the sake of convenience and budget, but if you have access to fresh broccoli and leeks, please substitute those in. It would also be great with additional veggies, like carrots, green beans or maybe even bok choi. Feel free to experiment with whatever seasonal vegetables strike your fancy, just keep in mind that they will take a little longer to cook. Anyway, cover and cook for about another five minutes, until the mushrooms have cooked and the broccoli and leeks are fully thawed. The broccoli is done when it has turned bright green and the mushrooms will be browned as well. 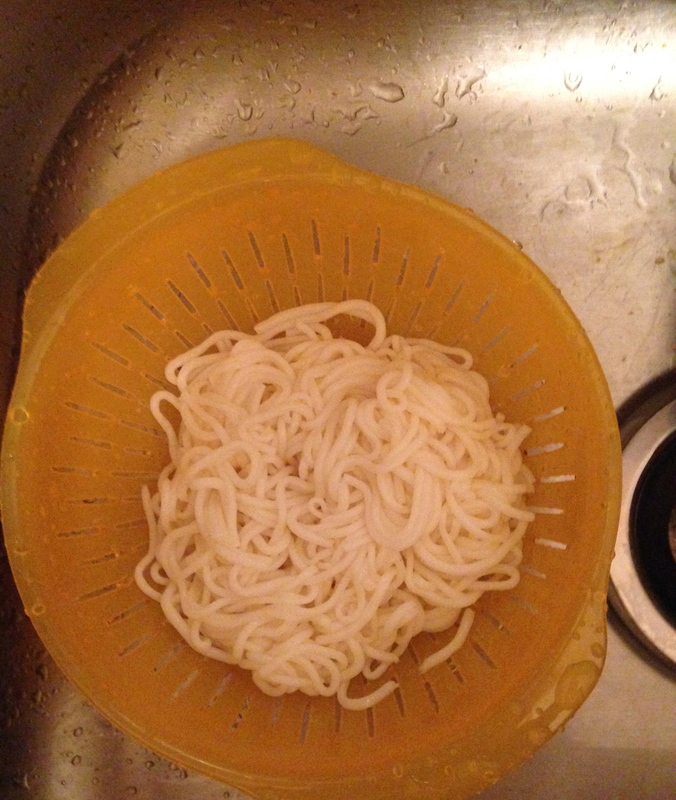 Remove the lid and stir in the shirataki noodles. Cover and cook 2 minutes more. 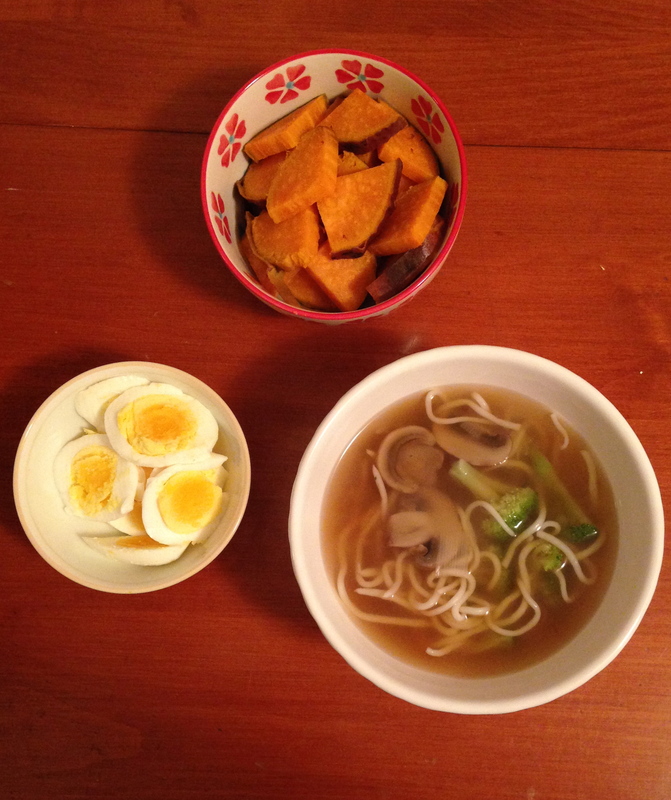 Ladle the soup into two bowls and top with sweet potato and egg slices. Enjoy!